What sounds better than a massage? How about a massage every month? As an Elements Massage member, you can get all the relaxing and healthy benefits of massage Every. Single. Month., for a special rate and no long term contract. It’s the most flexible program out there. You can share your massages with a loved one, and even roll them to another month. And with locations around the country, you can access relief and recovery nearly anywhere. 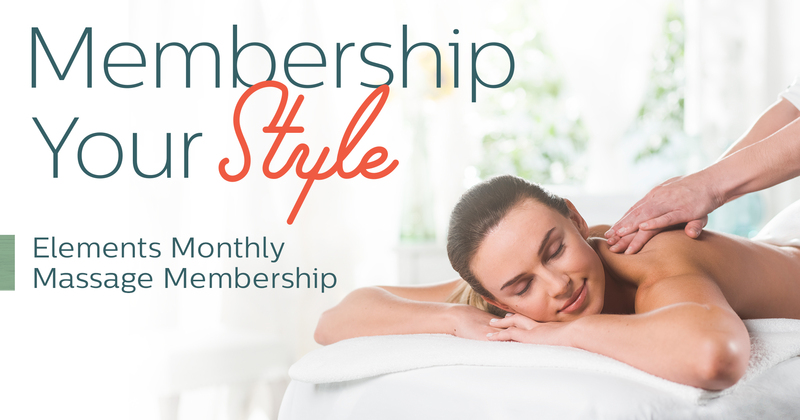 The Elements Monthly Massage Membership is stress free-stress relief. Elements Massage, where good health is delivered, just your style. Elements Massage 4991 Factory Shops Blvd. Elements Massage 14650 W. Colfax Ave. Elements Massage 2795 Speer Blvd. The Elements WayTM - We focus on providing a true therapeutic massage experience. Of the thousands of massages we deliver each year, we always treat your massage as our most important. Whether you need relief from pain, release from tension, stress reduction or simply to relax and feel your best, Elements Massage is committed to promoting your well-being.